What it’s about: It starts when Toro Okada gets a call from a psychic who his wife has recruited to find their missing cat. Okada is out of work, biding his time in their Tokyo home, preparing pasta and listening to operas on the radio as he waits for his wife Kumiko to come home from her magazine job. But once Okada gets the call from psychic Malta Kano, his whole life begins to change, becoming first unpredictable and dreamlike, but then startlingly vicious and desperate. Kumiko leaves him, ostensibly for another man, but Okada is unable to make contact with her and prohibited from hearing an explanation in person. Instead he is forced to communicate through her brother, Noboru Wataya, a famous television talking head with political ambitious, and a man who Okada can not help but loathe. His search flounders, and Okada finds himself looking not only for his missing wife, but for his own identity. He must deal with Malta’s sister Creto, who comes to him in sensual dreams that feel suspiciously real. He is taken under the wing of a woman known only as Nutmeg and her mute son Cinnamon. He meets a retired general who shares the atrocities of the war with him, including the day he should have died at the bottom of a dry well. Weaving through the story is the tale of the wind-up bird, an animal whose call keeps the world turning and keeps our story moving. The Wind-Up Bird Chronicle is a long story, not only in page length (607 in paperback) but also in the sheer range of the plot. The summary I’ve offered touches on perhaps the first third of the book and barely grazes the surface of the many strange events and peculiar characters in this tale. “Chronicle” is appropriate, as is “winding.” I’m usually a very quick reader, but this book was a challenge for me and took a very long time to finish. Perhaps it was the pacing, which is slow and measured, or perhaps it was the sheer density of the story. This isn’t to say that I didn’t enjoy the book. Murakami is a master of subtlety and his characters have a range and density that is captivating. It’s a truly rewarding book, Dickensian in its ability to capture character and setting. Would I recommend? Yes. 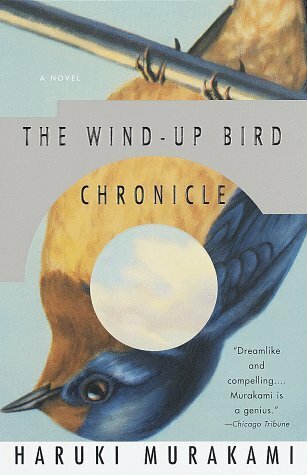 Wind-Up Bird Chronicle is one of those books you’re proud to have read, that seems like an important literary experience and leaves you feeling enriched.